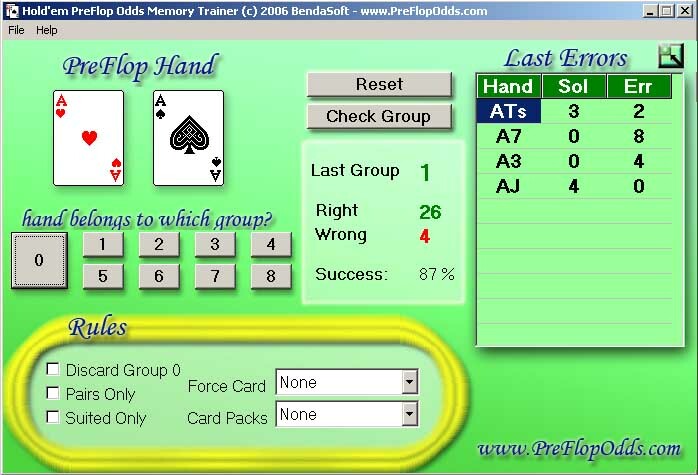 Preflop Odds Memory Trainer, remembering the ranks can improve your game dramatically, and make you money. It will allow you to know when it's time to add money to the pot or when it's time to get out quickly, and save money. This effective tool will help you accomplish the task easily and quickly. When you later get to the table, evaluating hands will be trivial and allow you to take advantage of this great technique, be successful and have fun! remembering the ranks can improve your game dramatically, and make you money. Because of the Ace, the hand looks good, right? Right! It LOOKS good, but statistically, if your opponent is holding even a suited 2-4, he has better chances to win! Sitting at the Poker table and running all the complicated odds calculations for each pre-flop hand is too hard and basically impractical. To help with that, the respected players and authors David Sklansky and Mason Malmuth came up with the "Hand Groups" technique, which simply assigns each hand with pre-flop values, according to their statistical chance of winning (hands in group 1 have the highest value, check out the table below). Protect your system resources and get you running at full speed. Play free memory game of twin numbers to improve your memory and attention. Qweas is providing links to Preflop Odds Memory Trainer 1.0 as a courtesy, and makes no representations regarding Preflop Odds Memory Trainer or any other applications or any information related thereto. Any questions, complaints or claims regarding this application Preflop Odds Memory Trainer 1.0 must be directed to the appropriate software vendor. You may click the publisher link of Preflop Odds Memory Trainer on the top of this page to get more details about the vendor.